It’s not every day you get to experience a member of gospel music royalty live but that’s what happened when Kirk Franklin came to the UK as part of Gospel Fest. On the day of the Queen’s honours list, someone who deserved to be knighted is Richie Dan after last night. Although the venue did eventually fill up, the crowd did take a while to warm up. And it was Richie Dan that finally got the audience up on its feet and dancing. No mean feat. There’s always a danger of having a crowds that are slow to react in venues of this size and it’s a problem that wouldn’t have affected the Birmingham venue as much. Either way, the support acts had their work cut out. The positive of the event is that it gave a huge opportunity to showcase gospel artists from the UK, most of which won’t have performed on a platform of this size. And who wouldn’t want to be on the same bill as Kirk Franklin? The evening started off with Volney Morgan New-Ye – a group that we’re big fans of. They did their usual high energy set which was great but the crowd was yet to reach capacity. Going on first at an even of this type will always have this challenge but New-Ye deserve props. Up next were the Uplift Choir, Soloettes and Gospel Essence – all acts we haven’t come across before but ones to look out for. The bigger hitters on the UK side of things were Richie Dan, Faith Child, Anastasia Baker and Guvna B.
Kirk Franklin took the stage and suddenly, the crowd had no problems getting excited. Kicking things off with A God Like You, the man himself was full of beans (but do you expect anything else from Kirk?) What followed was a journey through his entire discography. This wasn’t a set to plug an album, it was more of a greatest hits performance. He went old school, and we’re talking back when he had a jerry curl old school. The obvious starting point was tracks from his most recent album Hello Fear but it wasn’t long before he went all nostalgic on us. He spent a portion of the hour-long set in front of a piano and played some of his anthems from yesteryear. Silver and Gold, the Reason Why I Sing and Love all featured here. In many cases all it needed as one or two notes of the intro and the audience leaped into full voice and sang along. Going down memory lane with the man who gave us the songs in the first place was a lot of fun. The set came to an end with Stomp – one to send everyone home happy with. You could tell that he wanted to carry on as the set appeared to end abruptly but there was no short-changing that took place on the night. We had a whale of a time and our only gripe was the view we were granted from our seat right at the back of the floor section but that’s just a by-product of big venue concerts – not everyone can sit on the front row. But even from where we were sitting, it was clear to see that the crowd was feeling it. Yes, the appearance of Kirk Franklin on our shores isn’t an every day occurrence but when it does happen, it’s a special occasion that we’ll always jump at. 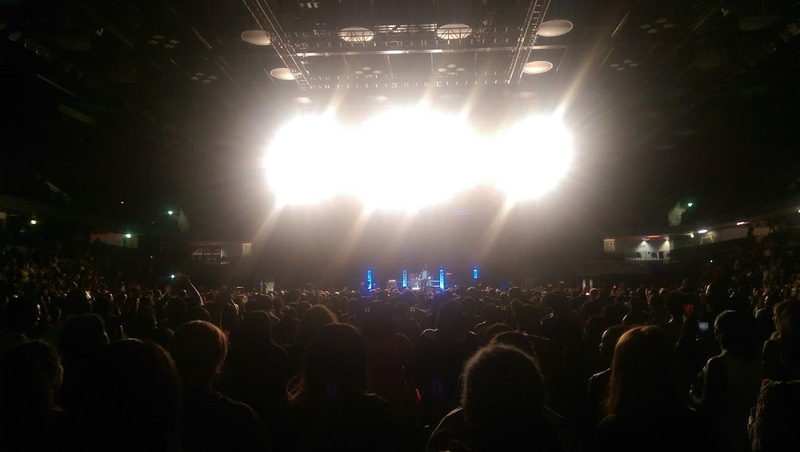 Message to the Gospel Fest 2015 organisers: Thanks for bringing KF to UK… BUUUT…. “what happened in London last night? I’m sooo disappointed… and I want to believe Kirk Franklin was too in the end as he throw his microphone on the stage floor and left not happy (not his fault). Why we had to pay £30 to listen over 2 hours local singers/groups (from 7.30pm to 9.45pm) then KF comes on stage and sing for 1:15 minutes only? We were all kicked out of the building by 11pm when we were all enjoying the main artist and we all notice that KF also found out he was going to stop singing soon. KF said very clear on the stage to all the audience that he just been told that he had 3 minutes to sing few songs. That’s not fair on him as an artist, bad reputation for London Gospel concert organisers. I don’t speak for all but for our group who was in the Arena from 6.30pm up to 9:45pm waiting to see KF. It was great to see him live. It was worthy the waiting BUT… BUT…PLEASE PLEASE… next time… less “guests” more of the main artist. (we all learn form our mistakes I believe) God bless you all.